Quest Software is the top winner in the 2018 People's Choice Stevie® Awards for Favorite New Products, a feature of The American Business Awards®, the U.S.A.’s top business awards program, which are now in their 16th year. The worldwide public vote was conducted last month, with the highest number of votes deciding the winners in a variety of product categories. More than 58,000 votes were cast. To win, a category’s leading vote-getter had to have received at least 100 votes. Quest, the Aliso Viejo, CA software developer won People’s Choice Stevie Awards in three categories, Cloud Applications/Services, Governance/Risk/Compliance Solutions, and Software – Other. LIMU LEAN Protein Shake Mix collected the most votes of any nominee. The crystal People’s Choice Stevie Awards will be presented to winners at The American Business Awards’ banquet on Monday, June 11 at the Marriott Marquis Hotel in New York City. There, the winners of peer-adjudicated Gold, Silver and Bronze Stevie Awards will also be presented their awards. More than 650 executives from across the USA will attend. All new products and services nominated in the new product awards categories of this year’s American Business Awards were eligible to be included in voting for the people’s choice awards. Sponsors of The 2018 American Business Awards include HCL America, John Hancock Signature Services and SoftPro. RizePoint - Brand Protection Takes a Leap Into The Future. When a company needs protection from issues related to safety, quality assurance and loss prevention, streamlined data can make a world of difference. RizePoint is a global leader in enterprise compliance for both internally imposed standards and externally imposed regulations. Their software builds and protects brand equity by enabling a consistent customer experience. Considered the industry standard for food service, hospitality, and retail, RizePoint mobile and cloud-based solutions serve nearly 2 million audits with 200 million questions answered annually. 2016 was a whirlwind year for RizePoint. The company rebranded themselves (formerly Steton Technology Group) and brought on a new executive team that launched two major software updates—a first for the company. They took their motto to heart by hiring the "best and the brightest" and that strategy paid off with awards, increased revenue and low turnover rates. Their successful transition lead them to winning the 2016 Silver Stevie Employer of the Year Award in the Computer Software category and the Silver Sales and Customer Service Award in the Business Intelligence category for 2017. 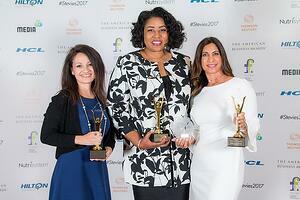 The 2018 Stevie Awards for Sales & Customer Service opens in June. Request your entry kit here. The compliance software industry is a growing space. RizePoint has nearly 20 years of experience in this industry but there are now more than 5 dozen startups doing some form of compliance software. Rizepoint attributes a lot of their success to Jesse Dowdle’s award-winning leadership style for paving the way for success at Rizepoint. They also thank continued partnerships with their clients in the foodservice and hospitality industry.